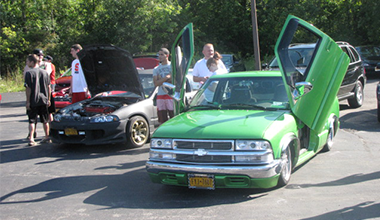 Thank you to all who attended our Car/Motorcycle Show on August 24, 2014. The weather was beautiful with a great turnout out of over 100 cars and 20 motorcycles through out the day. We had music by DJ ET, Castle Nascar along with products available for purchase. We also had great food available from Greece Hots, products from ROC City Designs, The Tint Shop and Honda merchandise. If you had a chance to make it out and have any feedback on the event please click on the link below to send Rhonda an email. To view more pictures from the event visit our Facebook page. *4dr, CVT. MSRP: $23,545. Model Code: CR2E3EEW. 36 month closed end lease. $3195 trade or cash down. First payment. $595 acq. Fee. Taxes + DMV fees due at lease signing. 12,000 miles/year. $0.15 overage. To qualified buyers through AHFC. Offer valid through 11/3/14. $149 per month lease for 36 months! *5dr, AWD. MSRP: $25,025. Model Code: RM4H3EEW. 36 month closed end lease. $3195 trade or cash down. First payment. $595 acq. Fee. Taxes + DMV fees due at lease signing. 12,000 miles/year. $0.15 overage. To qualified buyers through AHFC. Offer valid through 11/3/14. Winter driving presents a number of challenges to both you and your car. Cold weather tests the limits of your car’s mechanical abilities. Treacherous driving conditions test your abilities as a driver. The consequences can be very dire. You could end up sliding towards a guard rail wondering if your affairs are in order. It pays to be prepared. Here are our tips to get ready for the snow and sleet-covered roads and dipstick-freezing temperatures. Check in next month for more winter driving tips. Congratulations to Patrick (Service Advisor) and Brittany McTammany on the birth of their son Brodie William!! He was born on 8/19/14, 9lbs 12 oz and 21½ inches long. Good luck students and teachers on a successful year!